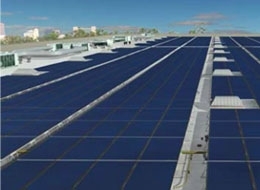 Commercial solar panel installation is a very exact discipline. The process begins with a conversation between the commercial building owner and the solar installer about the objectives of the installation. Objectives for commercial installs can vary from helping to offset the everyday energy requirements of a business, to a for-profit commercial solar farm covering many acres of land. The design of a commercial solar installation is the most important element dictating the overall efficiency and output of a given project. If the installation is destined for a commercial rooftop in a metropolitan area, it is essential that the solar installer take precise measurements of roof area, obstructions, and potential shading. Commercial solar hotline 877-331-1235. While most business owners are driven to embrace solar energy because they want to utilize clean energy sources, they are often surprised to find out that commercial solar power installations can be extremely good business too. Businesses have a wide variety of energy tax credits, solar incentives and rebates to draw on when implementing new energy strategies. Federal tax credits of 30% apply to all expenditures on solar panel installations, wind turbine installations, geothermal installations and energy efficiency projects. The 30% Federal energy tax credit that runs until 2016 is fully applicable to all commercial solar panel installations. In addition, many states also have solar energy rebates, tax credits and other incentives to help businesses lower the cost of going solar. Choose your state for more detailed information on the solar incentives available.